With the possible exception of Tom Cruise, learning to fly a helicopter demands months of classroom, simulator, and in-air training. The controls feature all the logic of Bop It: Twist one hand, move the other to the left. Push one foot, then the other. Watch the instruments, but don’t forget to look at the horizon. I once spent a full day working with Airbus’ top instructors, and by the end couldn’t even keep the chopper in level flight. I was nowhere near pulling off a low hover, a move that looks simple but requires extraordinary coordination and concentration. But last month, a group from the US Army, including one person who’d never even been in a helicopter, flew a Sikorsky S-76B helicopter up and over a small watching crowd in Fort Eustis, Virginia, hovered over an adjoining field, dropped down, adjusted their position to dodge another vehicle, then safely landed. And they did it all after as little as 45 minutes of training. “It’s pretty neat to see the transformation from ‘I have no idea what this system does’ to ‘I can now control this system,’” says Sikorsky helicopter pilot Mark Ward, who put the newbies through their minimalist training. “This is not to say that they’re combat-ready, hardened, ready to go. But it is a testament to the ease with which they can now adapt to a nonlogical control system like a helicopter,” he says. It’s not like these people are aeronautical savants (no offense) or leather-clad Carrie-Anne Mosses. But computers are key, as given away by the retro blocky graphic on the chopper: “Matrix Technology.” This, as you may have guessed, is no ordinary helicopter. It’s controlled by a hand-held tablet that lets wannabe pilots fly about using familiar gestures and movements, like they would to play a game or fly a quadcopter drone. 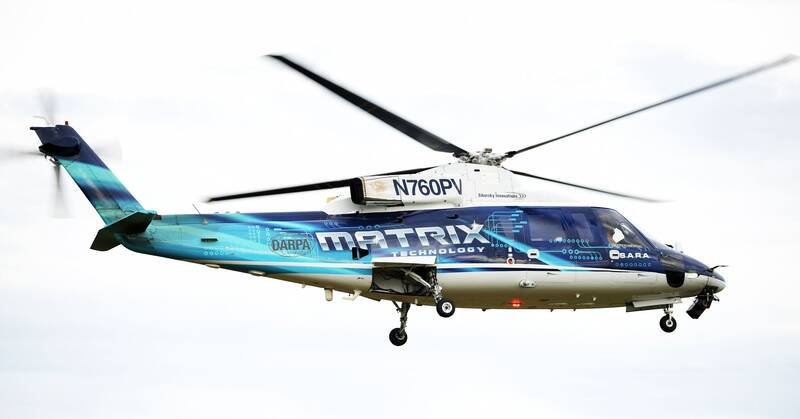 Matrix Technology is the name of Sikorsky’s program for rotorcraft that minimize, or even eliminate, the role of the human pilot. It’s part Darpa’s Alias program (that’s the Aircrew Labor In-Cockpit Automation System). Just as some automakers are approaching self-driving cars with gradually more capable driver assistance tech, the idea here is that making a chopper easier to fly is a step toward letting a computer take control. The human on board controls the flight using a tablet and a couple of joystick-like controllers called interceptors. “It allows the onboard crew members to rapidly communicate their intent to the autonomy system, which kind of becomes like a copilot,” says Igor Cherepinsky, director of Sikorsky’s autonomy program. Instead of learning the steps of the complicated throttle and pedal dance, the human onboard controls the flight using a tablet and a couple of joystick-like controllers called interceptors. The tablet is used for inputting mission changes, like changing the destination. The interceptors are for more immediate inputs, like a push to the right or a quick climb. But unlike in conventional flight, adjusting any of these controls leads to an input into the computer controlling the flight, requesting a change, rather than a direct movement of a flight control surface. This is fully fly-by-wire, under the control of an algorithm. “It allows the onboard crew members to rapidly communicate their intent to the autonomy system, which kind of becomes like a copilot,” says Igor Cherepinsky, director of Sikorsky’s autonomy program. The human gives orders, the computer executes them. Although Sikorsky put the humans in the helicopter for this demo, the system could work just as efficiently as a kind of remote control, says Cherepinsky, with the human on the ground below holding the tablet, or in a remote center, dialing in and supervising. Those applications could be useful for first responders like firefighters, who could direct aircraft over forest blazes from a safe distance. For the military, automating more aspects of flight could help make missions safer. “Really, we want the pilot’s eyes and mind on the fight rather than holding an altitude,” says Graham Drozeski, the Darpa program manager for Alias. For Darpa, Sikorsky is now integrating its system into a UH-60 Black Hawk helicopter, for more mission-driven demonstrations next year. In the civilian world, increased autonomy, and smarter helicopters in particular, could be a useful stepping stone on the way to fully autonomous air taxis, whisking commuters from building top to building top in Dallas and LA by 2023— if Uber has its way. At the same time, startups like SkyRyse are betting that helicopters with sensors and smarts will show that air trips can be cheaper, quicker to dispatch, and ultimately more useful than they are now. Even before they become fully autonomous, which could take years of technological and regulatory overhauls, they would lower the bar for human pilots.